Roberto Tiraboschi, in his novel La bottega dello speziale set in 1118, paints a picture of Venice very different from the city we know today. As soon as it gets dark, the calli are filled with gangs of people intent on bloody murder and general mayhem. It reminds me very much of NYC of the Will Smith movie, I am Legend. A rather beautiful capitèlo in the sestiere of San Marco. Today, the streets of Venice are amongst the safest in the world, even at night. Despite what the late Nicolas Roeg would have us believe, there are no evil dwarfs running around in red in Venice after dark trying to lure you to your death. Statistically, Venice is one of the safest cities in the world. It was as a result of the scary Venice described by Tiraboschi that one of the city’s most distinctive features, the capitèli, was born. These are the small shrines, with a picture of the madonna, or a crucifix, or a saint, that you can see all over the city today. They were introduced in the 12th Century to protect the city, but not in the way you’d think. In the 1100s, if you were a rich Venetian, you could afford to go around at night with bodyguards and servants carrying torches to light your way in the dark streets. The common people could afford no such luxury and so were often set upon by thieves, robbers, and murderers, lurking at in the streets leading off the campi, or by bridges. One bridge, in the parish of Sant’Anzolo Rafael, was so notorious for murders that it and the canal that flowed underneath became known as the Ponte / Rio dei Assassini. The situation had got so bad that, in 1128, Doge Domenico Michiel decided that he had to do something. He therefore passed a decree banning fake beards, which criminals used as disguises, and ordering that every parish priest had to place votive candles, or cesendeli, in the streets of his parish to act as a form of street lighting. The priests duly erected little shrines to hold the lights and often added holy images to accompany them. But the idea was that these capitèli, as they came to be known, were for illumination and not for spiritual protection. If you look at where the capitèli are located, often near bridges and crossroads, the most dangerous parts of the city, it makes sense. 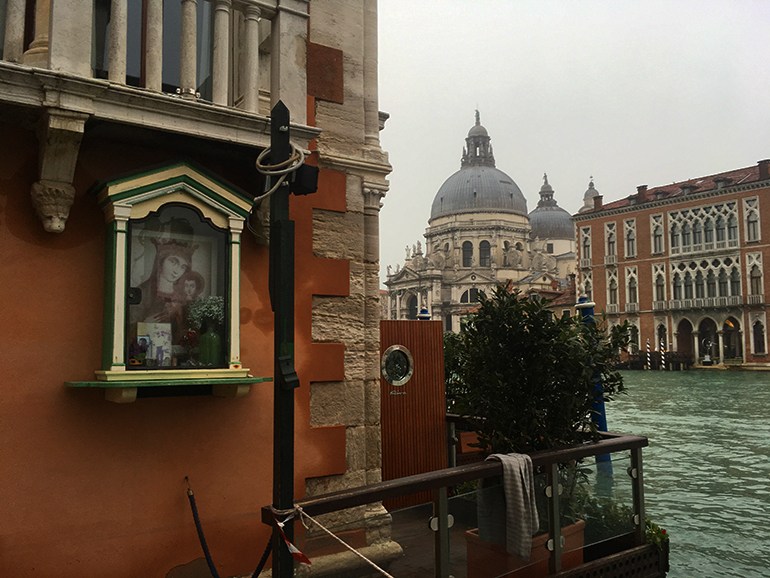 Over the years, visitors to Venice often remarked at how devout the Venetian seemed since there were more of these shrines to be seen in the city than in other Italian cities. This seemed at odds with reality since Venice was often in conflict with the Catholic Church over questions of papal authority and the state of the Venetian nunneries. When you understand the real reason behind them, it all begins to make sense. The Venetians were practical first and religious second. This capitèlo was located at the top of a particularly dark bridge behind the church of Santa Maria Zobenigo. The same capitèlo from a distance. Today Venetians are very proud of the capitèli which are cared for and looked after as monuments. Many of the original images have disappeared and been replaced with more modern ones. There is also a movement to sponsor cesendeli (votive candles) for the capitèli returning them to their original purpose. A capitélo with its votive light. Do you have a favourite capitèlo in Venice? Did you know what they were for? I’d love to hear from you in the comments. Molto interessante. Grazie Luca!. Will make a concerted effort to look for them next year. All in all, it’s going to be a busy week! Fascinating Luca! I’ve taken many photos of them over the years without understanding their original purpose. I know the shop window in Dorsoduro well and always wish that I could fit one of the mannequins in my suitcase! I learn so much in your articles, thank you! I have a question: on the very popular ponte della paglia, as S. Gorgio is at your back, and facing the base of the bridge toward ponte dei sospiri – at the base of the bridge, not on it – , there is what I think is a capitelo. It is of a Madonna and child, and Mary makes a holding place with her hands. Can you confirm, is this for a capitelo, for a candle? I will post a photo of it in my Instagram for your reference if needed 🙂 Thank you! It sounds like it. I’ll take a look at your Instagram and confirm. Yes it is. That would have been a common place to walk at night and the place is quite dark because of the bridge. Caffe Brasilia baccaro is on the corner of Calli de la Verona and Rio Terra Dei Assassini, it’s where I discovered lemoncello! Since it was but a short walk to my apartment, it became a “nite cap” stop on the way back to my apartment. Across the calli from the outdoor sitting is a large glassed in Gothic arch; I was told it was the location of the Gestapo during the WWII. I assumed these lovely capitelo were for spiritual purposes, so I felt safe on my way back to the apartment going around back of the Fenice Opera House toward Campo Zobenigo. Today with electricity many of these areas are well lit at night, but I can well imagine how dark without lights. Thanks for sharing this interesting topic!